This book brought together elements that aren't necessarily an easy topic to not only discuss but to write a whole book about. When We Collided by Emery Lord had such a uniqueness to it that in turn led me to falling in love with every page. I would give this book 6 out of 5 stars for not only the brilliant story line, but the characters were amazing as well. This story handles elements of Mental Illnesses that are sometimes overlooked upon society. It dealt with the matters of depression, as well as Bipolar Disorder. It clearly portrayed both of them really well and allowed us as readers to see what it was like through someone else's eyes. The story breaks down the POV between two characters shown through alternating chapters. I am usually not a huge fan of this and I tend to find is rather confusing to follow. However Emery Lord did a brilliant job writing this way. Never once was I even the slightest bit confused. Another thing I loved about this story was that it had elements of guessing and waiting to it that added something extra to the premise of the story. Overall, the story was amazing from start to finish. It's also a story that is very unique in this day in age. I loved reading from the POV's of the two main characters because they were so unique in each there own way. We, as readers were given two teens who struggled with the reality of life. The reality where life isn't always full of rainbows and unicorns. I think that is probably one of my most favoured things about this novel. The whole premise also enticed me and kept me interested the whole way through. Now for the character themselves, one highlighted character who I really enjoyed reading about was Vivi. One of the two main characters who's POV we saw every chapter. She was such an awesome character. I found myself bookmarking most of the lines that came out of her mouth. It was interesting to see her view on life as well as her slow loss of control over her mind. As for the rest of the characters, they were equally as enticing and brilliant. I loved her love interests family and friends. They were a good bunch of side characters. In conclusion I would highly recommend this book for it amazing story line, brilliantly written characters, and beautiful writing style. I would recommend it to those who enjoy the contemporary romance genre. As well as for those who like a diverse read. 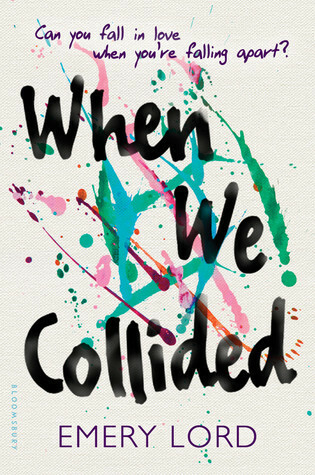 If you do pick up "When We Collided", I do hope you enjoy! I have been curious about this book. Thanks for the informative review, Sabrina!